What were the most iconic images of Asian Tsunami of December 2004? Every major disaster produces its own iconic images which determine how the collective memory of the world would remember the incident. Looking back six years later, which of the numerous images of the Asian Tsunami of 26 December 2004 have achieved that iconic status? It was one of the most widely photographed disasters of our time — but which handful of images do we remember now, more than 2,000 days later? One image that lingers, for its frozen horror and tragedy, is this one taken by Reuters photojournalist Arko Datta in Tamil Nadu, southern India. It later won him the World Press Photo and other international awards. For a mega-disaster that was distributed over a very large area along the Indian Ocean rim, covering a dozen countries in South and Southeast Asia, there must be more iconic images — either globally or nationally. What image/s do YOU remember the December 2004 Tsunami by? It doesn’t matter if they the image was taken by a professional photographer (i.e. one who is paid to do that job) or a holiday maker or a local resident…as long as it was widely shared and has entered our collective consciousness. Please nominate your images with links, which we will display here. This photo is a fake! Note: Beware of fake tsunami images that are in circulation, which some people are peddling either knowingly or unknowingly. One of them — allegedly the waves hitting Phuket in Thailand — is exposed at Urban Legends as digitally imagined fantasy. Another set of images is real enough — but have nothing to do with the tsunami. 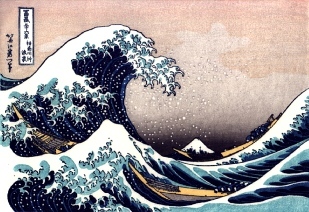 These show people running away from an oncoming burst of water, seemingly a big wave. They are of a TIDAL BORE, not a tsunami, taken in October 2002 at the Qiantang Jian River in Hangzhou, Zhejiang, China — an area known for tidal bores.